Coal ash could also contaminate floodwaters from the hurricane. Environmental groups are warning that flooding of animal farms caused by Hurricane Florence could contaminate floodwaters with pig and chicken waste. In 1999, Hurricane Floyd caused massive flooding in the Carolinas. Overflow from agricultural fields resulted in waterways being contaminated with animal waste and carcasses, sewage and pesticides. North Carolina changed some policies since then, including added restrictions on new hog farms and how they manage pig waste. 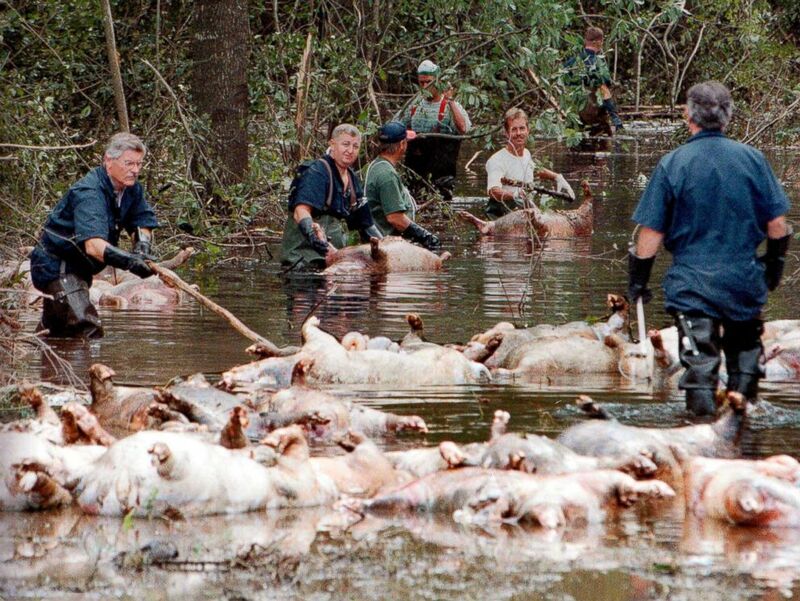 (Alan Marler/AP, FILE) In this Sept. 24, 1999, file photo, employees of Murphy Family Farms along with friends and neighbors, float a group of dead pigs down a flooded road on Rabon Maready's farm near Beulaville, N.C due to Hurricane Floyd. The North Carolina Pork Council said farmers are moving animals to higher ground and draining waste lagoons to prevent some impacts of flooding. "I have seen farmers this week working relentlessly to make sure they have the necessary supplies on hand to care for animals and protect their farms. I’ve seen harvesting of crops well into night, knowing much of the corn not picked now will be lost. And I know that a dry August growing period has led to low lagoon levels on our farms – such that we can handle 25 to 30 inches of rain in the lagoons," Andy Curliss, CEO of the North Carolina Pork Council wrote in a blog post. Many hog farms in the area now use a "lagoon" system where the animals' waste is stored in a pond on the property and sprayed on fields as fertilizer. The lagoons are supposed to withstand 25 inches of rain, but parts of North Carolina could see as much as 40 inches of rain. "There's no question that the intensity of this storm and the rainfall that it will bring is something they're just not designed to deal with," Will Hendrick, manager of the Pure Farms, Pure Waters campaign with the advocacy group Waterkeeper Alliance told ABC News. Hendrick said all their concerns have happened with storms in the past and that they're "hoping for the best, preparing for the worst." "There is no circumstance in which this system can withstand these storms of increasing frequency and severity," he told ABC News. Waterkeeper will be flying over flooded areas after the storm and taking pictures of any flooding from farms to report to the state environmental agency. Hendrick said they want to "make sure that we are out there to see the full measure of consequences faced by North Carolinian because of this storm." Chickens can be a problem too. Poultry operations don't use the same kind of lagoon system but millions of chickens died at farms during Hurricane Matthew in 2016. After Matthew, volunteers from Waterkeeper Alliance who flew over the area reported that barns housing up to 1.8 million chickens flooded and even reported seeing chicken carcasses in the water. A spokesman for the North Carolina Poultry Federation said Matthew was a problem partly because it hit so quickly birds couldn't be moved in time and that in one county multiple farms were flooded after an earthen dam overflowed. "This isn’t our first rodeo. Matthew is still fresh on our minds from two years back. We’ve been prepping since last week. Rearranging processing schedules to get birds out of the field early, topping up feed bins, talking to growers making sure all emergency generators are operating and plenty of fuel to run them in case of power outages. Moving birds to higher ground and in some case moving to another farm location. The welfare of the birds is something we take seriously," spokesman Robert Ford told ABC News. In addition to potential contamination from agriculture, there are sites storing dangerous or contaminated materials around that state that could leach out if flooding reaches unmanageable levels. 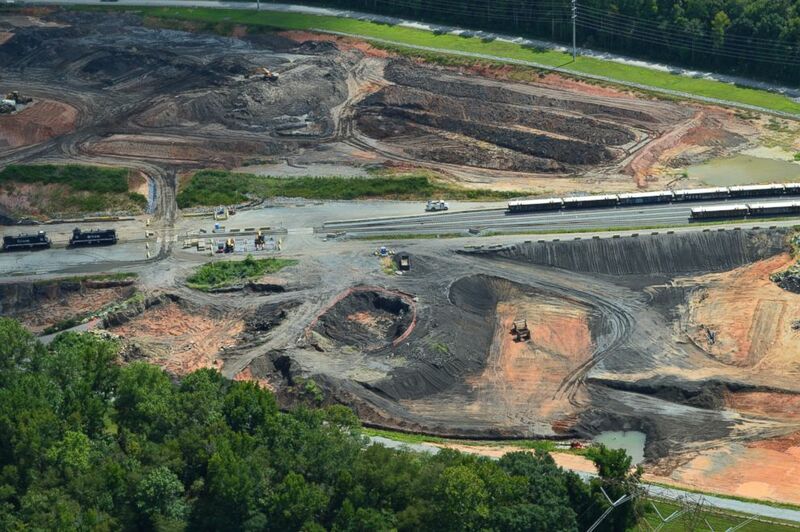 (Waterkeeper Alliance Inc) Pictured is the Riverbend coal ash cleanup in Mt Holly (next to Charlotte), NC, Sept. 12, 2018. The company's storm director Howard Fowler said they lower water levels in the coal ash ponds and that they have "plenty of capacity" in the event of flooding. They will also be inspecting sites after the storm to ensure that the toxic materials in the ponds don't spread into floodwaters. "We are well prepared for this and I know our nuclear team will respond appropriately and ensure the safety of the plant and I'm sure the public as well," Duke Energy's North Carolina President David Fountain told reporters. Officials from Duke Energy in North Carolina also said they have taken steps to prepare its nuclear plant in Brunswick County, North Carolina. They said staff at the nuclear plant will shut down operations two hours before any hurricane force winds and will be on site throughout the storm to monitor any flooding. Environmental Protection Agency staff are monitoring 40 contaminated sites, as well as large oil facilities, and other facilities that deal with hazardous materials or chemicals in North Carolina, South Carolina and Virginia ahead of the storm. EPA officials, along with the Army Corps of Engineers, will be on hand to respond to any hazardous debris or materials in the floodwaters. 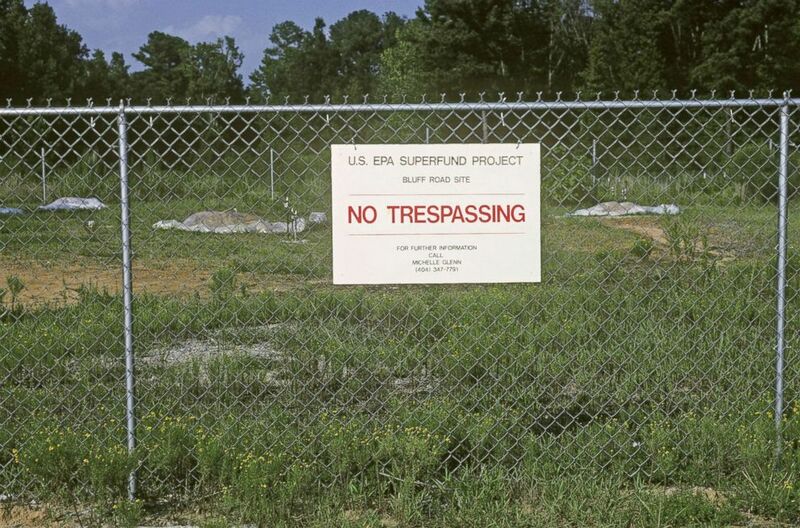 (Getty Images) EPA Superfund site at Bluff Road near Columbia, South Carolina. The property had been used for waste storage. Superfund sites, a list of the most contaminated areas of the country, are managed by EPA and the party identified as responsible for the pollution or hazardous waste. An EPA spokesperson said that part of the process for managing and cleaning up these sites includes anticipating extreme weather. After Hurricane Harvey in Texas, the EPA confirmed that at least one contaminated Superfund site leaked toxic chemicals after the flooding. There are 41 Superfund sites in the Houston area and at least 13 were impacted by flooding and possibly damaged by the storm. Some floodwaters after Harvey also tested positive for E. Coli 125-times higher than the level the EPA says is safe and officials warned that floodwaters could be contaminated with sewage, chemicals or bacteria.